One of my favorite quick lunches is one that I can make at home and also on the trail for hiking – all it takes is the time to cook the pasta to have a hot lunch for two. 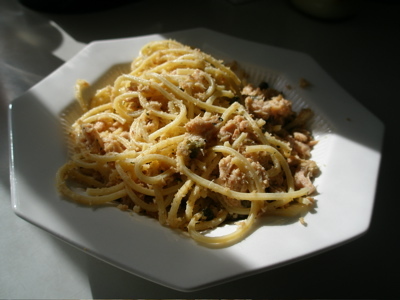 The recipe below is for home prep – if I were to trail cook it I would pack up the capers undrained in a small bag (they are pickled and have great carry life), bag up the cheese and bread crumbs separately. The pasta is easy to cook in a 6-8 cup pot. Everything else is the same recipe wise. Bring a pot of water to a boil (say 2-3 quarts water). Cook pasta for time on package. Reserve 1/2 cup pasta water and drain pasta. 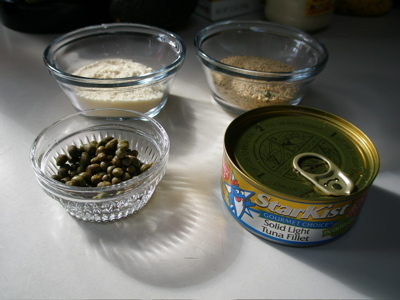 Add the tuna with oil and the capers to the pot, breaking up the tuna. Toss in the pasta, along with 1/4 cup of the reserved water. Toss and add more water if pasta appears dry. Toss in the cheese and bread crumbs. Add black pepper to taste.